Rafael Yglesias, A Happy Marriage (New York: Scribner, 2009). 369 pp. $26.00. Few books have disappointed me more than Rafael Yglesias’s novel A Happy Marriage. Its title raised my expectations to probably unreachable heights. I have complained that the tradition of the novel is far more open to adultery than faithful marriage. I have regretted how very little of ordinary life—family life—gets into American writing. A Happy Marriage promised at first glance to reverse those trends. It is touted by Scribner as an “achingly honest story about what it means for two people to spend a lifetime together—and what makes a happy marriage.” But it is none of that. It aches not; neither is it honest. And it is not about what makes a happy marriage. Yglesias, now fifty-five, first made a splash when he dropped out of his private high school to become a writer, publishing his first novel at seventeen. Hide Fox, and All After (1972) was about a teenager who leaves his private high school to become an actor. His second novel, appearing four years later, told the story of a young novelist who published his first novel in his teens. As the main character of A Happy Marriage ruefully admits, his fiction tends to be autobiographical. To date the principal exception of Yglesias’s career has been Fearless (1993), about the survivors of an airplane crash, filmed the same year by Peter Weir with a screenplay by the author. In his ninth novel—his first in thirteen years—Yglesias reverts to form, writing a flimsily disguised autobiographical account of his wife Margaret’s death from bladder cancer five years ago. Something the poet and critic William Logan wrote upon reviewing Yglesias’s second novel The Work Is Innocent in 1976 bears repeating:When an author hews so closely to the facts of his life, one wonders if any life, merely described, has the drama and integrity a novel demands. Fiction substitutes drama for the sustained personal insight of, say, a memoir. We would insist that autobiography more closely examine acts that stand here more symbolic than understood.After reading the opening chapters of A Happy Marriage, I began to suspect that Yglesias had chosen the transparent disguise of autobiographical fiction precisely to avoid examining his nearly three-decade marriage to Margaret Joskow more closely. Narrated in alternating chapters, the book traces the early stages of the romance between Margaret Cohen and Enrique Sabas—the same surname as the hero of Hide Fox, and All After—and the late stages of her terminal metastatic cancer. Enrique is twenty-one when he first meets the four-years-older Margaret and fifty when she dies. When she was first diagnosed, he tried to encourage and cheer her, although he was frightened:But all those desperate feelings were long ago, two years and eight months ago, one hundred and forty-seven days and nights in the hospital ago, three major surgeries, a half dozen minor surgeries, and fourteen months of chemo ago, two remissions and two recurrences ago. Looking back through the defeated gaze of fatigue, it seemed inevitable now that it would end like this, this inch-by-inch dying, this one-track terminus when hope had become a skeleton’s grin.Detailing the progress of her disease like this, through the gaze of his own fatigue, is not as narcissistic as it may sound. The terminal cancer patient has the relatively easy part. All she must do is to die. The spouse is left with her permanent absence. A Happy Marriage, then, might have been written to invoke her presence—to seek an immortality for her, and to share it with her. Yglesias dedicates the novel simply “For her.” But from first to last, his attention is upon himself. Margaret comes to life only as she affects him. Enrique knows as much—when heading out to purchase birthday gifts for her he realizes that he is ignorant of her tastes, when a marriage counselor asks her how she feels about their marriage he realizes that he has never made the same request—but the knowledge never grants him the power to overcome his self-involvement. He accepts it as his fate or donnée. The marriage of the title is merely Margaret’s status. Only once—in a deathbed interview with her mother upon which Enrique eavesdrops—is Margaret glimpsed in relation to someone other than him, although he confides plenty about himself apart from her. As this chapter of their lives closes, he and Margaret enter marriage counseling. Fifteen years later they are in Venice for their twentieth wedding anniversary. In the very next chapter—at this point Yglesias discards the mechanical device of alternating chapters—they are back in therapy, fifteen years earlier. To his credit, Enrique realizes that, in “his social class and time, New York 1983,” the conventional wisdom holds that a “bad marriage was worse for a child than a divorce.” He decides to break off the affair and remain with Margaret. Twelve years later, in 1995, his father dies of prostate cancer. In his grief, he accuses Margaret of not loving him. She protests. “I’m never going to stop loving you,” she says. “You’re my life.” Apparently these are the peaks of a happy marriage: courtship, surviving adultery, a memorable anniversary trip, solace during grief. At one point during their courtship, Margaret tells Enrique about all the classes she has taken—tap dancing, photography, lithography, French, basic acting technique—all for fun. He reflects:He too wanted to know as much as possible about how the world worked. Not, however, for something as pointless as having fun. He wanted information to impress readers and to burrow into a character’s inner life. Work was the most invested and complicated expenditure of most people’s time; it bothered him to write about characters and not know, in a tactile and intimate way, precisely what they did each day on their jobs.An excellent point, and perhaps more novelists will begin to write about something other than writing and a writer’s special worries. Yglesias will not be among them, however. He cannot even be bothered to say anything about what his wife Margaret did each day on her job; she worked as the deputy art director of Newsweek. He is rather good, though, at something similar. He captures life on the strange and distant planet of late-stage cancer. Only then, with her tubes and shrunken flesh and consciousness dimmed by drugs, is Margaret truly other—perhaps because the experience is so defamiliarizing, and perhaps because she must go through it alone. There is little else to recommend the novel. It frequently reads like a roman à clef. Some of the key is included. Yglesias’s father, called Guillermo in the novel, was a Cuban-American novelist, and his mother Helen Yglesias (Rose in the novel) was also a novelist. Margaret’s family is described in terms that makes them equally easy to identify. Her father Jules Joskow cofounded National Economics Research Associates, a consulting firm, in 1961; Andrew Joskow, her younger brother, now serves as its senior vice president; her older brother Paul Joskow is a professor of economics at MIT. Naturally, then, you want to guess the true identity of Bernard Weinstein, the young Cornell graduate who introduces Enrique and Margaret. Thwarted in his ambition to become a novelist,he had evolved into one of the country’s leading cultural critics, and certainly its most visible. He had reviewed books for the daily New York Times for ten years, movies of The New Yorker for five, was still a columnist for Time as well as the author of two bestsellers of general cultural musings.Same for Porter Beekman, a New England novelist who is the second-string movie critic for the New York Times. You find your fun, pointless though it may be, where you can. But after a while the enjoyment pales and the eyewitness account of terminal cancer yields information, but no insight. The reason did not strike me until I did a bit of digging. Although the events of A Happy Marriage antedate the deaths of his mother and half-brother—Helen Yglesias died in April 2008 at the age of ninety-two, while Lewis Cole, a film professor at Columbia University, died six months later at the age of sixty-two from Amyotrophic Lateral Sclerosis—neither of them receive any charity from the author. Enrique describes his mother Rose as unvaryingly self-pitying, while his half-brother Leo is “willfully dense” and useless to Enrique in his ordeal: “[I]n lieu of visiting Margaret at the hospital, [Leo] insisted on inviting Enrique over to his apartment for dinner. . . .” Even his father is cheerfully dismissed as narcissistic. This is not honest. It is merely vicious. “My father and mother talked about novelists at home, and I thought they were gods,” Yglesias told the New York Times upon the publication of Hide Fox, and All After when he was seventeen. 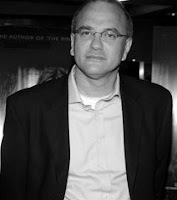 “I wanted to be a god, too, in a sense, to have some power.” Rafael Yglesias appears never to have recovered from the heady arrogance of teenaged authorship, and in A Happy Marriage he has told the story of a marriage that was happy because it outlasted the death of his wife. Margaret Joskow must have been an extraordinary woman, but from this novel the best you can do is to suppose so. Welcome back from your vacation. I hope it was a refreshing break from the routines of teaching. I enjoyed reading your critique of A HAPPY MARRIAGE, and I am certainly not including Yglesias' novel on my list of "must read" books; this underscores one of the great values of literary criticism and astute reviews: a reader can make informed decisions about what to read next. However, you touch upon an interesting aspect of reading and criticism when you speak of your high expectations and your disappointment. On the other side of the coin, though, it is wonderful to be pleasantly surprised by a book that holds only slight promise. I cherish those positive encounters, and I dread the disappointments. Now, because of your critique, I can avoid a disappointment. I just finished the book and could not agree more. He shares the narcissism he accuses his father of. Every inch of print seems dedicated to detailing his unrecognized heroics. By his account his wife never knew of his infidelity, but she suffered the consequences of his emotional distance and neglect -something he never examines or ties back to initial her plea not to say he loved her unless he meant it. She loved him but he stayed for the kids. His care for her at the end of his life is laudable, but it seems a penance. Bernard was right. I did like the book, and I can't help wondering if there's a gender divide here. It's hard to tell because on Amazon, the posts are almost all female. I'd be curious to know how others felt about the book. I think Myers is correct in some of his observations; yet the book touched me in a way that I'm still trying to figure out. Your review seems to be more of a judgement of the main character (or author) than an actual judgement of the book. Whether every bit of it actually happened or not (it is published as fiction) it is well written and engaging. I love it's honesty. People aren't always good and it takes guts to admit that about yourself, as Yglesias has so courageously done. And it is meant to be from Enrique's perspective. I don't know why that bothers you. I found your critique of the book to be over the top negative, so doubt whether you will post this comment. My wife and I read the book aloud together and found it completely engaging. The characters seemed convincingly authentic. And it is obviously close to the authors' true experience. And that truth is happy and sad..the actual marriage had to be a loving marriage, but not always "happy". The person who decided not to read the book because of your comments has made a big mistake. My review may have been “over the top negative” (high praise for my money, since I detest the book), but your own is purely subjective. You also need to understand that fiction is not a mere transcript of actuality. Read again Logan’s comment on one of Yglesias’s earlier novels. I too did not like the book. I found the author to be astonishingly narcissistic. It was painful to read after the first half. Especially because the author did not seem even remotely aware of how his own self regard dominates the book. He is constantly standing outside of the relationship evaluating it and his life in ways that seem shallow for someone who are been in a relationship for a long time -- physical beauty, and career accomplishment. So many other things to look at and measure that involve deep connections. I did not see any kind of self-awareness that might have come out by him talking about her perspective, or that of his children. Those are oddly missing from a book about a marriage, and family.